Instantbird 0.3 beta released in 10 locales! I’m excited to announce the release of Instantbird 0.3 beta, the first localized preview of what we have been working on for months, available in 10 locales (Czech, German, English, Spanish, French, Dutch, Polish, Russian, Slovak and Ukrainian)! In addition to the cool features already introduced in the previous two alpha releases (among which the Twitter support, tags, contacts merging, …), this beta brings significant appearance changes with user icons, an updated tab style, the improved default message theme, Aero glass effects on Windows and more awesome new features! As Instantbird 0.3 is almost finished and already localized, thanks to the great work of our localizers who were eager to share Instantbird with people speaking their language, this beta release is a great opportunity to give Instantbird a try, play with it, and report bugs! Download Instantbird 0.3 beta now! 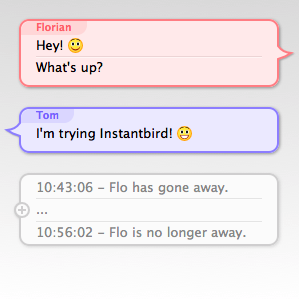 We look forward to receiving your feedback to help us make the final Instantbird 0.3 release (planned for this month!) a piece of software you will want to share with all your friends! The most common feedback we received from users that quickly switched back to Simple (the previous default) or another theme was that the lack of timestamp for each message made the theme unusable. Some users have really passionate opinions about whether these timestamps should be shown or not. On one hand, people think it’s a useful piece of information that should always be visible, but on the other hand, people think it’s a waste of space on their limited screens. The common “solution” to this problem is to include a “show timestamp” preference, allowing each user to decide for themselves which of the two behaviors is the least inconvenient. I don’t think that making the user responsible for choosing between two not-so-good options which one is best is a good way to address this issue. So soon after the 0.2 release, I started searching for better solutions. We are pleased to announce that Instantbird 0.3 alpha 2 has just been released. Contacts: If you talk to the same person on multiple IM networks you can now combine the buddies from each network into a single contact. Just drag and drop one onto the other and they will be merged! Tags: Tags have replaced groups in the buddy list. Even though our tag system isn’t fully implemented yet, there are already some new features. For example, a tag can be hidden by clicking the “x” on the right side of the buddy list, all buddies from this tag will then show in an “Other Contacts” tag automatically, which is shown at the bottom of the buddy list. Windows (and Linux) users will appreciate the minimize to system tray feature, for which we borrowed some code from the popular MinTrayR add-on. By default Instantbird will minimize to tray when the “x” is clicked, to quit the application choose “Quit” from the File menu or right click on the system tray icon and choose “Quit”. This behavior can be changed from the preferences window. On Mac it’s now possible to close the Contacts window without quitting the application. A click on the dock will reopen it. Download or learn more about Instantbird 0.3 alpha 2. We used to handle most support requests received from the contact AT instantbird DOT org email address on a mailing list which was private. This was inefficient as we replied to the same questions over and over and people couldn’t benefit from old replies. New posts to the mailing list will now be publicly readable so that anybody in the community can help users with support requests (see our guidelines describing how we have answered emails up to now), answer questions, or just read the feedback we receive. Note: if you don’t have or don’t want to use a Google account, you can subscribe by email using the [Groupname]+subscribe@googlegroups.com address. Instantbird 0.3 alpha 1 has just been released. However, it includes basic support for Twitter and is already quite stable; so it will please early adopters and testers who don’t go as far as to use nightly builds (which update themselves everyday with the newest code). Add-on developers will also be interested, especially because of the new ability to create restartless add-ons. I (Florian) was in Brussels this week-end for the FOSDEM conference. As every time I went to FOSDEM, it was great to meet again several Mozillians I hadn’t seen for a long time. I gave a talk early on Sunday morning about Instantbird. I would like to thank all the people who attended the session, asked interesting questions and gave great feedback at the end of the talk and during the rest of the day: thank you! For those of you who would have liked to be there but couldn’t because of the time (too early, especially after the great dinner and bowling event Saturday evening) or location (not everybody lives in Europe! ), I put the slides of my presentation online (and even wrote down what I said!). It’s time again to give an overview of what we’ve been doing in the last few weeks and what we plan to do next. The rewrite of the buddy list backend is going well. The new implementation, is almost usable (as long as you don’t need to add, remove or rename a contact). I can’t wait to land this in our nightly builds! (This will occur as soon as everything is re-implemented so there is no feature-loss). Bug 555 tracks this work.